How Would Jay Bilas Fix The NCAA? How fitting that it's the University of Miami—long one of the NCAA's favorite targets—that has pushed the organization to its moment of crisis. Never again will the words "Miami" and "scandal" conjure images of a rogue college football program. From now on, they will conjure images of a rogue college sports association, one that finally seems destined for major changes. If you haven't kept up with the National Collegiate Athletic Association's Miami investigation, here's a quick primer: After building its case around the statements of a felon, Nevin Shapiro, the NCAA hired one of Shapiro's personal lawyers, who leveraged her subpoena power in Shapiro's ongoing bankruptcy case to obtain information for the association that it couldn't otherwise get. Historically, schools have quietly taken their lumps from the NCAA. The last thing they wanted to do was invite more scrutiny for their programs. But Miami's president, Donna Shalala, went on the offensive, accusing the NCAA of "unprofessional and unethical" behavior. In a world that the NCAA has long ruled with despotic power, this measured statement qualifies as an act of rebellion. What's more, it speaks to a broader shift in public perception: Increasingly, we are seeing the NCAA less as the guardian of the cherished ideals of college sport than as the overzealous enforcer of its own dubious rules. After the Miami debacle, what university is going to submit to the unchecked poking and prodding of NCAA investigators? 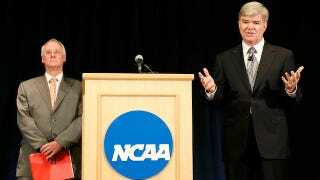 The NCAA as we know it is finished. It's just a matter of time. The only question is what's going to replace it. One possibility is reform from within. Last week, Jay Bilas—a lawyer, ESPN analyst and former center for the Duke University basketball team—called on Emmert to step down. Let's say, for the purposes of this thought experiment, that Bilas were in charge instead. What would he do? He'd start by replacing the NCAA's 400-plus page rulebook—"a ridiculous mess that none of us would want to live under," Bilas tells me—with a much shorter one. No longer would buying a prospective recruit a hamburger be defined as an ethical violation. Gone would be the sections and subsections that dictate how schools can go about recruiting and enrolling "student-athletes" and determine their eligibility. In other words, Bilas's NCAA would govern athletic competition—and leave the moralizing to the schools and their conferences. "These are accredited universities," he says. "They don't need some clearinghouse in Indianapolis telling them whose high-school credentials are good enough to admit." Gone, too, would be the restrictions against athlete compensation, even if that meant sacrificing the NCAA's tax- exempt status and covering workers' compensation claims for injured players. "We've been dishonest for a long, long time," Bilas says. "The idea that every person in the system except the athlete can be paid at market rates is just laughably stupid." Then there's the NCAA's inherently corrupt judicial system. The NCAA not only makes the rules and polices their enforcement, it prosecutes the cases—before an NCAA committee, naturally. Its investigators can spend years developing a case (as they have with Miami), leaving programs to compete in the ultracompetitive world of recruiting beneath a cloud of uncertainty. Once a school finally receives a "notice of allegations" from the NCAA, it has just 90 days to respond. By this point, thanks to careful leaks to the media, an NCAA- friendly narrative has invariably taken hold. The standard of proof of guilt couldn't be mushier—the evidence has to be "credible, persuasive and of a kind on which reasonably prudent persons rely in the conduct of serious affairs." Not that it matters much: No school ever contests the charges brought against it for fear of reprisal from the NCAA's famously vindictive and capricious infractions committee. Bilas would replace all of this with a proper adversarial system. Cases would be overseen by, and argued in front of, an independent judicial body, the American Arbitration Association. Of course, in Bilas's NCAA, how much need would there be for such a body? For that matter, in Bilas's NCAA, how much need would there be for the NCAA? Once you start stripping away the senseless rules and regulations, the association's multimillion-dollar compliance empire quickly crumbles. What's left? An organization that hangs nets, keeps records and puts on a postseason basketball tournament that anyone would leap at the chance to run—and for a smaller profit margin. Maybe the best NCAA is a nonexistent NCAA.